The women in Polly Rosenwaike's Look How Happy I'm Making You want to be mothers, or aren't sure they want to be mothers, or--having recently given birth--are overwhelmed by what they've wrought. Sharp and unsettling, wry and moving in its depiction of love, friendship, and family, this collection expands the conversation about what having a baby looks like. One woman struggling with infertility deals with the news that her sister is pregnant. Another woman nervous about her biological clock "forgets" to take her birth control while dating a younger man and must confront the possibility of becoming a single parent. Four motherless women who meet in a bar every Mother's Day contend with their losses and what it would mean to have a child. Witty, empathetic, and precisely observed, Look How Happy I'm Making You offers the rare, honest portrayal of pregnancy and new motherhood in a culture obsessed with women's most intimate choices. "I rejoiced in this collection. A radical, unflinching cycle of stories that radiate with truth and depth and care. I could weep for how good it is to see such rich, profound narratives about women's reproductive lives. Happy tears." 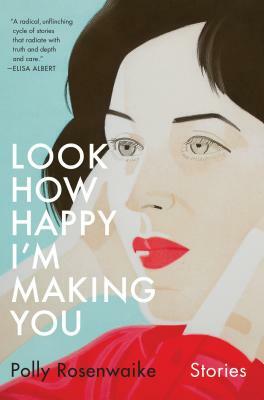 "Each story in Look How Happy I'm Making You is a lovely universe unto itself -- funny, intimate, casually profound -- but there is something transcendent about reading them together like this. Rosenwaike's women all have different desires, different fates, different circumstances, but each of them conquers the maddening unknown of motherhood with richness and depth."